67 talented young athletes from Cardiff including swimmer Chloe Tutton will benefit from a £42,000 fund – thanks to leisure charitable social enterprise GLL, which manages Cardiff’s Better Leisure Centres on behalf of Cardiff Council. The local athletes will be supported through the GLL Sport Foundation, the largest independent athlete support programme in the UK, which this year marks its 10th year of supporting today’s and tomorrow’s athletes. Chloe Tutton being presented with her ambassador award by Peter Bundey, Chair of the GLL Sport Foundation. 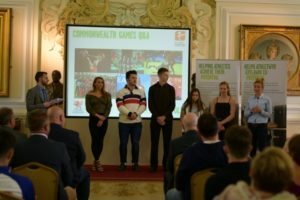 The lucky recipients were announced at a special awards ceremony held at Cardiff City Hall last night (Tuesday 8th May), in partnership with Sport Wales and SportsAid Wales. 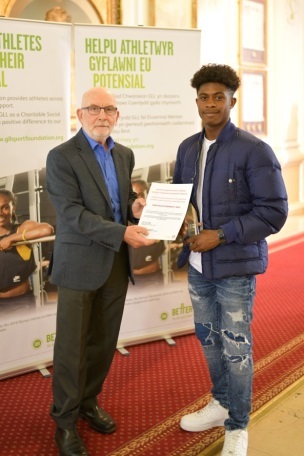 Supported athletes will receive award packages that include financial grants of up to £1,250, free training memberships to use Cardiff leisure centres’ facilities and across 300 GLL and partner operated sporting venues. 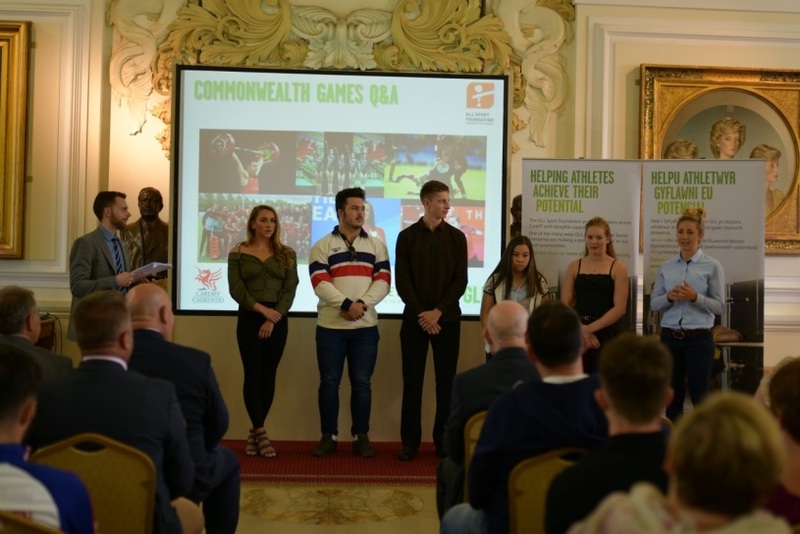 They will also benefit from access to sports science, medical support through partner university Cardiff Metropolitan and employment opportunities all focussed towards supporting their athlete journey. During the award night, Sport Wales in partnership with the GLL Sport Foundation launched a sports award in memory of Wales sporting and political icon Rhodri Morgan, it was fitting that two young athletics athletes won the award in its inaugural year, those athletes were Welsh internationals Sarah Omorogie (shot putt) and Jeremiah Kennedy-Azu (100m sprinter). Jeremiah explained “Its an honour to win the Rhodri Morgan Sports award he achieved so much across many agendas with a core focus on Wales and its people and I will do my upmost to achieve what I can in my chosen sport of athletics”. 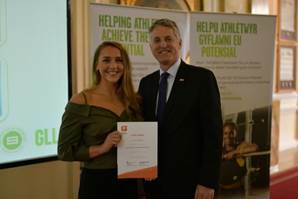 Chloe Tutton, 21 from Grangetown, who recently won a bronze medal in the Women’s 200m Breaststroke at the Commonwealth Games in Brisbane, received an Ambassador Award. Chloe said on receiving her award “My main goal now is to compete and medal at The Tokyo 2020 Summer Olympics but along the way I have a number of sporting competitions to compete in, such as The European Championships in the summer”. The athlete awards cover Olympic, Paralympic, Deaflympic, Special Olympic and Commonwealth sporting disciplines. With a staggering 93% of award recipients receiving no other sport funding and 84% of recipients being aged under 21, the Sport Foundation has highlighted a vital funding gap for young talented athletes currently competing at National and International levels. One of last year’s recipients was Welsh Rugby Union player Elinor Snowsill from Radyr, Cardiff. She also received an Ambassador Award this year alongside Chloe Tutton. Elinor has 48 caps for Wales including three World Cups and eight 6 Nation Tournaments. She was recently a member of the Commonwealth Games 7s training squad. She will become one of the Foundation’s Ambassadors this year. Elinor, recently returned from Brisbane, commented “I am very grateful for the support I, and many others receive from the GLL Sport Foundation. It is a constant challenge to balance the demands of being a high performance athlete with working or studying full time, and foundations like GLL help to alleviate some of the challenges that arise during this time”. Question and answer session with the 6 Cardiff athletes that competed in the 2018 Commonwealth Games: Elinor Snowsill, Jolie Ruckley, Anna Hersey, Alf Dinnie, Jordan Sakkas and Chloe Totton. Juliette Dickinson, GLL Regional Director for Wales, commented “The wealth of young sporting talent within Cardiff’s local communities is truly inspiring. We are delighted to play our part in supporting the development of sporting talent across the city where GLL operates sports and leisure facilities. We believe that the vast majority of the athletes that benefit from the GLL Sport Foundation will give something back to sport and society in a positive way; whether as a future champion inspiring the nation, sports coach, volunteer, fund raiser or as an inspirational role model to other young people to get active and involved in sport”. “I would like to thank all our partners and sponsors for their support for the programme. 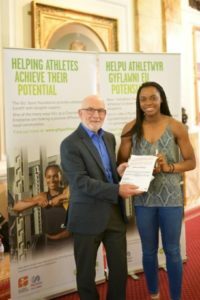 SportsAid and SportsAid Wales provide the direct links to Sport Governing Body talent pathways, whilst our many corporate sponsors headlined by GLL and Technogym, numerous local authorities, university and physiotherapy partners directly contribute to support these sporting dreams to become a reality”.